I started coloring the week after Trump got elected. I’m fairly certain adult coloring was trendy before that, but make no mistake: the 2016 election was the thing that drove me into a Target store, stress eating popcorn, grabbing coloring books and markers off the shelf as if my life—or at least my mental health—depended on it. Experts proclaim adult coloring to be “therapeutic” and a successful way to reduce anxiety. I know this because once upon a time, I pitched four book ideas to an agent, and one of them was a coloring book for moms. I did my research; I read the articles. Plus, I don’t know about you, but I can only color so many Paw Patrol sheets before my mind goes completely numb. Adult coloring seemed a hell of a lot cheaper than booking appointments with an actual therapist to rant about politics, which is why, on the same day I picked up a coloring book at Target, I instituted 5pm as the official “Art Hour” in our house. I covered the coffee table in wrapping paper while the show played, careful to only place washable markers within arm’s reach. I tossed Paw patrol coloring books, Elmo sticker books, and a handful of plain white paper on the table. As soon as the show ended, I turned the TV off and turned Pandora on, rotating every other day between Delta Rae and Trevor Hall stations. I closed my computer, the news, all social media apps, and tried really hard not to think about everything I’d read that day for thirty whole minutes. Sixty if I could keep the kids interested that long. Everett colored, Carson scribbled, and I placed all of my anxiety into a collection of fine-tip markers, moving them up and down and all around shading in flowers and butterflies. A couple months ago, I learned that my friend’s daughter, Riley, was having a hard time in fourth grade. Her family had just moved to a new town, and some of the girls at the new school were picking on her. I felt oddly protective of Riley, even though she’s not my kid. I’ve never even met her. But her mom has been writing with me for almost three years now and when her mom feels the heartache of motherhood, I feel it too. I asked Riley’s mom if it would be okay if I sent a letter and care package to Riley in the mail. She said yes, and I got to work. As I sat down to write a letter to Riley, my mind transported back to a scene from my own 4th grade. It was a field trip day, and we were on a bus, although I cannot remember where we were going. I do, however, remember a girl making fun of my outfit. I went to a private Christian school with uniforms, so any time we had a “free dress day” it was a pretty big deal. My outfit had been carefully chosen. I can’t be certain, but I am 90% positive I was wearing a vest of some kind. Obviously today, at 31 years old, this story is hilarious to me. But at nine? I was devastated. I told Riley all about my experience and reassured her that 4th grade is hard and sometimes girls aren’t nice. I’m usually not one to dole out advice, but considering the 20+ year age gap between us, I felt slightly obligated to shed some light on the situation. After all, I’ve learned a thing or two about coping skills since I was her age. With my pen to paper, I started drafting a list of what Riley could do to feel better the next time someone picks on her. 1) Eat some candy. Not too much, but a little bit of sugar can work wonders. 2) Color a picture. When the world is ugly, sometimes the best thing you can do is make something beautiful in response. 3) Write your feelings. This could be a story, a few words, or just a bunch of sad faces. There’s no right or wrong way to write your feelings. Your mom is really good at this; she can help. 4) Put on Dr. Pepper chapstick. This is actually the most important step. I can’t explain it, but when I was in 4th grade, this was my superpower. As soon as I put it on, I felt 100x better. Keep this in your backpack at all times in case of emergency! I folded the three-page letter and tucked it into a padded envelope with a coloring book, journal, pack of jelly beans, and tube of Dr. Pepper chapstick (which was surprisingly hard to find). I said a little prayer for Riley and dropped the package at the post office. I am sitting in my tiny living room surrounded by women with their hands on me. It is 2012 and I am weeks away from meeting my first baby. There’s a hand on my thigh, my ankle, my pregnant belly, a few on my back. I have just taken my turn sharing my testimony and they are praying over me to close the night. Camille leads the charge, her hand firm on my shoulder. With power in her voice, she lays out a specific prediction. It feels like an earthquake in my bones. I felt tingles when I prayed that prayer over you. I felt so strongly that it was the Holy Spirit; it wasn’t anything I planned on saying. I’ve been thinking of you a lot and your transition to motherhood. 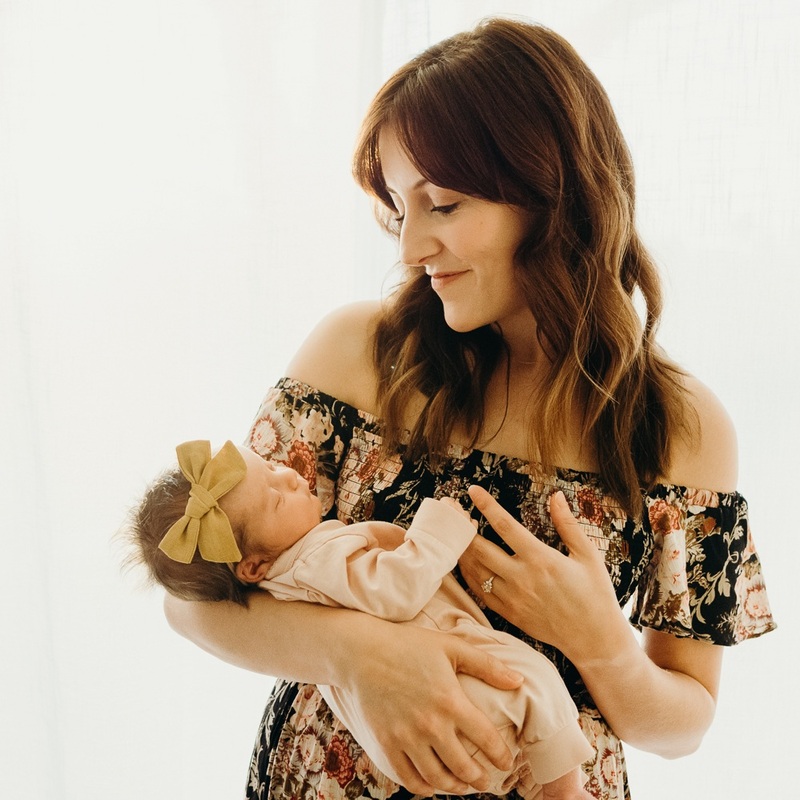 I feel like motherhood is going to be a broad calling for you, not just with your precious baby, but there are going to be many girls that will look to you as their mother. There will be girls that will feel drawn to you for mentoring, advice, encouragement, and spiritual leadership. You are a magnet and God is not going to pass on giving you opportunities. I did not have the slightest clue what Camille’s prayer would mean for my life, but I let her e-mail live in my inbox for five years just in case. Every time I log on to Twitter, there is a new thing to be angry about. A fresh outrage. 100 recent injustices in the news. Corruption. Terror. It’s everywhere. All of the time. And no amount of adult coloring is going to erase it. The hardest part of having a book come out in this type of political climate is that you start to feel really, really stupid. You start to ask yourself questions like, do these words even matter? To anyone? There are bombs going off in Syria and terrorist attacks in London and do not even get me started on the horrifying joke that is our current administration. Every day I lead a team of women who are committed to encouraging mothers through the art of storytelling. I used to think it mattered. A lot. I wouldn’t have worked this hard, for this long, for this little money, if I didn’t think the work was worthwhile. But lately I find myself asking, is this necessary? Does anyone even need this? Everywhere I turn, the world is ugly. And the louder the news gets, the quieter my voice becomes. The world is on fire and here I am typing away, wasting my damn time. I want to tell you something about God. Something you probably won’t believe if you don’t believe in God, but something I feel pressed to tell you nonetheless. You see, God has a solid track record of affirming my work right when I’m at the peak of despair. It’s usually when the enemy is speaking directly to my soul, leading me to believe that I’m a horrible writer, a horrible leader, and a horrible person. Your work doesn’t matter, he hisses late at night. You are nothing, this work means nothing, you should just quit now. You’re a joke, an imposter. You should find better things to do with your time. Everything you've ever done is meaningless. I hear him at 3am while I toss and turn under the sheets. I pray him away, but the words burn in my head till I wake up. This silent battle continues for weeks in the middle of spring. The devil in my ear, magnifying my insecurities and squelching my confidence. He's determined to cast doubt in my mind and plant fear in my heart and make me question everything I have ever believed. And then on a Friday morning in May, like a ray of light, a short story appears in my Instagram from a woman named Callie. She has left me 12 long, private messages. I begin reading, and learn that Callie had spent the day at the hospital being thoroughly checked for breast cancer. She left her preschooler and newborn at home with her husband, crying as she left. On the way out the door, she grabbed her copy of The Magic of Motherhood and shoved it in her purse. She tells me how she felt panicked in the car, and turned on the Coffee + Crumbs podcast to keep her company. She tells me how she read the first three chapters of our book in the waiting room, blissfully distracted. As I trailed behind the doctor into a new room, it really hit me. I picked that book up today so I wouldn’t be alone. Today I needed a friend, a support crew. Something to feel connected to before I received what could be life-changing news. As I sprinted out the door earlier, it was your written friendship I grasped. I hadn’t even realized how much I didn’t want to be alone. But there I was, supported, in a pale pink waiting room, by stories and writers I’ve never even met. Callie was quick to tell me she was fine and healthy (praise God! ), but I had tears streaming down my face all the same. Here I am, a mom of two young kids in California, questioning the very work the Lord has put in front of my face. There she is, a mom of two young kids in Australia, clutching the same work in her hands on a day when she felt alone and scared. There God is, in everything, all of the time, connecting the dots and weaving the story together, making sure His voice is always louder than the one I hear hissing in the middle of the night. “The E-mail” lands in my inbox on a Wednesday morning. Aggressive. Rude. Unnecessary and not constructive in the slightest. I’ve been writing on the Internet since 2009 and you’d think this stuff wouldn’t phase me anymore, but it does. She is angry that we use the word “motherhood” on our site when we have not launched grown children into the world. She is offended that we have the nerve to write about our experiences when our children are so young and our scope is so narrow. But really, at the heart of it, her message is loud and clear: your work is meaningless. If God can deliver messages through people on earth, I suppose it should be expected that the enemy would do the same. A careful response is crafted with help from my team—peaceful, but firm. I click send and the e-mail immediately bounces back. Of course she used a fake e-mail address. “Coward!” I shout as I slam my laptop shut. Angry at the amount of energy I have just wasted, I stand up and look around. I need to fix the morning, to redeem the day. This situation calls for something more than a coloring page, but I’m pretty sure if I start writing my feelings, a high volume of the f word is going to come out. I grab my own Dr. Pepper chapstick and roll it back and forth in my hand for a minute before applying it. I need to make something beautiful. My eye catches a plastic Target bag sitting near the front door. It contains small gifts that should have been sent weeks ago. I go back to Instagram and re-read a string of messages from another stranger named Brittany, fresh tears forming in my eyes. Brittany and her sister had been pregnant together, due the same month and year. Two days after Brittany delivered a baby boy, her sister delivered a stillborn daughter. I try to imagine this; my close friend and I had our second babies just a few weeks apart. What would we have done if only one baby had survived? The grief is unthinkable. I grab some tissue paper from the hall closet, pivoting into my office to retrieve one of the few remaining signed copies of The Magic of Motherhood from my bookshelf. I sit down at the dining room table to sign a card before tucking a journal, two candles, two face masks, and the book into another padded envelope. I say a little prayer for both sisters, and drop the package at the post office. I am sitting at a candlelit dinner with 20 women, taking turns passing a giant amethyst rock clockwise around the table. The rules are simple: whoever holds the rock shares something they’re scared to say out loud. No skips. The stories are more heartbreaking than I imagined—tales of miscarriages and near-death experiences, alcoholism and eating disorders, broken marriages and postpartum depression. Five minutes in, I stop fighting the urge to cry. It is pointless. I cry on and off for the duration of the dinner, secretly wondering if there are traces of mascara smeared all over my face. It’s Chrissie’s turn now—a woman I have known for exactly one hour. Her story is perhaps the simplest of all: she is lonely. With three young children under her care, she often feels too anxious or overwhelmed to attend playdates and mom groups. She’s home a lot. She tells us how someone tagged her in the event post on Instagram, and, in preparing to attend, she hopped on Amazon and purchased our book. Her words echo in my mind as I fall asleep, keeping the hissing at bay. I know he'll be back soon, but tonight, I rest. Last I checked, the world is still ugly. I think it will be until Jesus comes back. My coloring pages aren’t really helping anyone, but my other art is. I believe that. I have to believe that. I believe it because no matter how far back I look in the rearview mirror of my life, there God is. Over and over again—laying out the plan, opening the map, and telling me which way to go. I never see the whole picture, but I always see enough to take a leap of faith (even when I'm terrified). I wish courage came before obedience, don't you? Until then, let's keep going, Lord. Only by Your grace, may I look around this ugly world and keep making beautiful things. on writing terribly, bathhouses, and a blogging crisis. I recently used a couple babysitting hours to visit a bathhouse. If you don't know what a bathhouse is, don't worry, I didn't either until I showed up. Asha Urban Baths is new in town, and when I saw their name pop up on Facebook a few times, I took it as a sign. Last week I booked a babysitter, threw my swimsuit and coverup in a backpack next to a half-empty spiral notebook, and off I went. I was the only person there for 90 glorious minutes. The check-in girl commented on this fact, twice. You're so lucky, she said. I nodded silently, not sure if I should feel guilty about this or go buy a lottery ticket. It felt like I was playing hooky from school, skipping out on my children and my inbox to sit in a gigantic tub of warm water all by myself. With my legs curled up under me on the step, I opened my journal and wrote "New Years Reflection" across the top, followed by a single mantra for 2017: work smarter, not harder. Take care of my body. Take care of my mind. Take care of my soul. Writing night once a week. Read 17 books in 2017. Attend one creative conference this year. More "think" days. Blog again. Blog. Again. Full recognition, on paper, that blogging is no longer a thing that I do. I (somewhat unintentionally) stepped back from this space in 2016 to focus on growing Coffee + Crumbs, to work on the book, to save my marriage (that's a joke, or is it? ), to see my friends, and to occasionally breathe into a paper bag away from my laptop. I came back a few times when I had words swirling in my head and needed to put them somewhere. Like here and here and here. And it felt good to get those stories out. Familiar. Like when you visit your Grandma's house in the woods and it always smells the same and she has chocolate fudge waiting for you on the counter. But it also felt a little awkward, a bit out of place, like when you slip on a dress you haven't worn in three years and look at yourself in the mirror. Does this still fit me? Is this even in style anymore? Am I pulling this off? 1) I need to stop blogging altogether. Make a formal announcement. RIP where my heart resides; you've had a good run. 2) I need to start blogging again. I miss it. I miss writing here. I miss writing, period. This drummed up a lot of (first-world problem) confusion. I remember last January making the resolve to cut back on my blogging with an internal pledge: only write when you have something to say. And for 2016, I think I needed that, to be honest. There were a lot of business dealings in 2016: contracts, agreements, e-mails, new accounts, forms, statements, and on and on and on and on and on. 2016 was the year of the left brain; the year of We Need To Figure Out How To Make Money Or Bust. But 2017? I want to do things a little differently this year. I don't know if people still read blogs. I don't know if people still read this blog. But I do know that once upon a time, this was my writing home, and I felt comfortable and safe here. I could be honest. I could be silly if I wanted to be. I could write and hit "publish" and go about my day without thinking about it too much. Even more importantly: I felt accountable here. Whether lots of people were reading or hardly anyone was reading, I felt a responsibility to show up. I had a routine. I was disciplined. My attendance record was solid. In the span of blogging from 2009-2016 I even stopped calling myself a blogger and began calling myself a writer. Come to think of it: that self-professed title change might be one of the greatest values this blog has ever culminated. I miss it here. I can't pinpoint when this happened, but somewhere along the line in 2016, I got so bogged down in logistics and spreadsheets and e-mails, that I started to believe I had nothing worthwhile to say. Every time I sat down to write outside of a deadline or specific commitment, I was empty. Every time I sat down to write for me, to write for fun, to write for you, there were no words. Just fear and insecurity (can I call them Satan?) whispering in my ear: do you need to say that? You're adding to the noise; the world doesn't want or need your story right now. Taking a break from writing is a slippery slope for me. I can only equate this to peanut butter cups. I'm talking about the dark chocolate ones from Trader Joe's, you know the kind that come in a tub? You pluck one out carefully. Just one. And then one turns into two and two turns into three, and six wrappers later, you feel both shame and satisfaction. It's easy for me to skip writing for a day. Eh, I feel uninspired. I'll write tomorrow. And then tomorrow rolls around and there's a new episode of This Is Us on Hulu and that for sure sounds like a better naptime plan than writing. I'll write tomorrow! But tomorrow comes and I can't think of a good opening line for that essay floating around in my head so I give up on it altogether because the act of starting feels too damn hard. And then one day turns into one week and one week turns into one month and pretty soon I can't even remember how to write anything anymore because I cannot bear the thought of sitting down and writing something terrible. I don't know what happened to me. This isn't my best creative self, which is terrifying to admit the year I am co-leading an entire course on creativity. I wasn't going to complete the course myself because isn't that backwards for the teacher to become the student? But I went through the January lesson tonight and one of the assignments was to sit down and write two pages without thinking. These are my two pages of not thinking. And I suppose now that I'm done I can shut my laptop, close my eyes, and dream the night away even though I may have written something terrible. to be brave with your art. It is probably the goal of most writers to get their words in front of other human beings. Writers want their writing to be read, right? (Say that three times fast.) When I first started writing for an audience of zero, it was liberating. I had thoughts and I wrote them down and I hit publish and I questioned nothing. No regrets, no doubt, no worrying, no panic. Just think, type, publish, repeat. Think, type, publish, repeat. Over time, my audience grew to three, and then four, and then five. And then maybe twelve. And then more. I stopped counting. I have no idea how many people are reading this now. I can look up how many people click on this page, sure, but I have no idea how many people are actually reading this. There is a difference. A big difference. Something weird happens when you start writing for more people. You become acutely aware of what you are saying. You analyze your sentences more often. You write with an open thesaurus because you want to make sure the words you use are the words you actually mean to say. You second guess some of the words, and some of the sentences. You delete this, delete that. Re-write that thing, re-write this thing. I am learning to be a better editor, and I think that is good for me and good for my writing. But then a tiny wave of panic rolls in, and you start to write something else. You start writing negative comments in your head, filling in the blanks as you go. If I say this, they'll say ____________. If I say that, they'll assume___________. If I say this, they'll think_________. It's....crippling. Pretty soon you've written enough one-star reviews to fill up an entire online gossip forum, all based on what? Fear? Doubt? Your own multiplying insecurities? I've recently come to terms with something: I am never going to be a good writer if I write safe. And truth be told: I write safely a lot. The bigger the audience grows, the safer the stories I tell. I'm going backwards, I can feel it in my bones. God keeps giving me more and more, and I keep telling less and less. I'm writing small instead of big; scared instead of brave. I'm writing this today in case you also find yourself going backwards instead of forwards. In case you also find yourself creating art from a place of fear and doubt instead of courage and confidence. Let's not waste another day crippled by our own insecurities. Let's take the talent God has placed in our hands and be good stewards of those gifts. Let's write the truth and use all the paint colors and sing every note and dance with our whole bodies. Let's be brave with our art. Let's start today. writing for the in between, learning as we go. Welp. Coffee + Crumbs has been up and running for six weeks, and as of today we've hit 1.6 million pageviews. In that same time frame, 42 women (!) have sent me writing samples, expressing a desire to write for us. Our Facebook page has grown from 0 likes to more than 1,400 likes and we've received over 300 comments on our posts. We've even made a whopping $152 off our recommendations page (fist pump!). And while it's not all about the numbers, I wanted to share those numbers here, with you, because this blog was the launching pad for Coffee + Crumbs, and I figured if anyone would care about this tiny success, it would be you guys. I've been mostly overwhelmed by all of this, but in the best possible way. When you dream up an idea in the shower and that idea actually becomes somewhat successful rather quickly, it's validating. And to be perfectly honest---that validation is necessary when you're seven months pregnant and tired and irritable and lacking motivation in every sense of the word. I'm learning what it means to be a writer all over again, what it means to string words together intricately with purpose. I'm learning how to edit, and how to ask people to edit me. I'm learning the beauty of slow writing and slow blogging---the benefit of letting our words settle and breathe, rather than churning out content like popcorn. I'm learning how to encourage my writers and how to handle criticism gracefully and how to celebrate the wild success of a team effort. I'm learning that as much as I like to write on my own, I like to write with a team even more. I'm learning there is a fine line between writing for the mothers-to-be and the mothers-who-already-are; a fine line between scaring pregnant women and sugarcoating reality for the moms living in the trenches. I'm learning that it is virtually impossible for every word of every post to resonate with everyone. I'm learning that we're not just writing for the first-time moms or the soon-to-be moms or the struggling moms or the empty nester moms. We're writing for all of it, for everyone, for all of the in betweens. Real talk: that is a daunting audience. I've got more than 90 writing samples in my inbox and more than 20 official submissions waiting to be read. I'm trying to pull the best of the best and provide the widest net---essays for this mom and that mom and her over there. I'm trying to find the variety and the balance between the good and the hard and the messy and the beautiful. 1) I wish that every post you read resonates with you in some way, even if it's just one sentence or a handful of words. Even if her story is not your story and her baby is not your baby and her struggle is not your struggle, I hope you can pull some truth from her truth. 2) I wish that every post you read opens your eyes to the reality of one other mother on this planet who has graciously and bravely shared her story with you. I hope that you become a little more aware, a little more open, a little more compassionate, a little more accepting of someone else's walk. 3) I wish that every post you read on Coffee + Crumbs leaves you feeling encouraged. I hope you leave our site feeling more understood, less alone, and slightly more hopeful than you were before you started reading our stories. Thank you for reading, for being part of our success, and for giving us the one thing we need to keep doing this: a kind and gracious audience. I have always wanted to be a writer, and I recently decided to take the plunge and become a freelance writer and editor. But I am deeply terrified and find that I am talking myself off the ledge at least once a day. I haven't even started yet! Basically, I want to know if you have any advice for a newbie freelancer drowning in her own fear? I know that you took the step not too long ago yourself. How did you push through it? I wish I could tell you how I have overcome my own fear of failure and figured out how to be brave and vulnerable in my writing, but alas, I am still figuring out how to do that. One day at a time, one word at a time, I am still learning how to embrace the mere title of “writer”, let alone how to simply be one. I guess if I had to offer you advice, it would be this—start slow. Dip your toes in the water. Find yourself, find your writing voice. They are often one in the same. Be honest and heartfelt. If you wake up at 2am with thoughts swirling around in your brain, just get up and write them down. I have done that more times than I can count. Make space to write, space to think. Writing needs time, it needs room to breathe. Sometimes that means turning the TV off and heading to Starbucks at 8pm on a Wednesday night by yourself. Surround yourself with people who believe in you. That is not a cliché, that is actually what you need to do. When I say “people who believe in you” I do not mean “people who tell you what you want to hear”. You simply need a team, Your A Team, to be there to lift you up when you feel like giving up, as all of us writers do at some point. You're married, right? Your husband should be your biggest supporter. If your husband is not a writer (like mine), you will need to explain to him what it means to be a writer. You will need to explain to him that when you say, “I need to write” it is the same thing as saying, “I need to go to therapy”. It is essential, non-negotiable, a need to be taken seriously. You won’t always need to write, but sometimes you will. It's your job to determine when writing is a need, and it's your husband's job to support you in that need. Self-doubt is a beast. It will eat you for breakfast if you turn your back for half a second. In my experience, the best way to fight self doubt is to limit the noise you expose yourself to. For me, noise = blogs and Pinterest. I use those things in moderation to connect with other people and feel inspired, but there is a fine line between feeling inspired and completely losing yourself. I've learned that the less noise I expose myself to, the better my art is. It’s easy to look at someone else’s writing and say, “They already wrote about that topic, and said it better than I can.” But here’s the thing about writing: nobody can say anything better than you can, because you have your own story to tell, your own life to live, and your own lens through which you see the world. If you put 100 writers in a room and ask them to write about the sunset, not two stories would be the same. That is the beautiful and hard thing about writing—it is 100% you, 100% of the time. If you’re struggling to write, take a break. Don’t force it. If you have one hour to write, set yourself up for success, whatever that means to you. For me, that looks like a clean room, stretchy pants, and a burning candle. Setting the stage is part of the process. Always carry a notebook. Talk to strangers. Invite yourself into stories on a regular basis. Know what your art is worth. In these technology-driven days, people simply do not value art. They will want you to write for free, almost all of the time. Say yes when you want to say yes and say no when you want to say no. You are never obligated to create art for free. When you DO create art for free, that is your gift. Be generous with your gift. God gave it to you for a reason. p.s. Want some advice? I am not an expert, on anything, but I will always tell you what works for me (ashlee.gadd@gmail.com). p.s.s. My favorite advice book. I highly recommend. embracing our inner imperfect hostess. Click here to read the rest over at Darling Magazine! It's my first time writing for them and I'd like to do it again so if this story resonates with you, would you mind leaving a comment over there to show me some love? Thank you!